Celebrity Hairstylist & beauty expert Billy Lowe is proud to announce the arrival of his luxury hair care line. After 6 to 8 months of researching countless product manufacturers, I'm excited to announce that products are on the way. Among these manufacturers, Shiseido Laboratories approached me last November about developing my line. This 100+ year old brand really shares my passion and vision for beauty and I am proud to announce my partnership with them. The line is clean, simple, and easy to understand and will consist of the following red carpet Billy Lowe products. Nourishing Volume Shampoo & Conditioner - Just like it sounds, gives amazing volume, weightless style and silky smooth hair. Daily Hydrating Shampoo & Conditioner - Great for hair that needs a moisture boost. Gently cleanses hair while adding an extra moisture lock. Silky Style Cream - My favorite style cream for smoothing hair, fighting frizz & giving brilliant shine. Great for that red carpet blow-out. It only takes a little. Ultimate Finish Spray - Amazing (humidity resistant) hairspray that lets you shape, style, and reshape if needed. 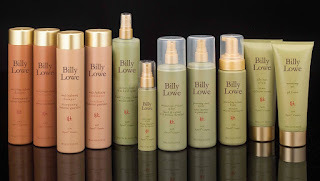 Experience your own Billy Lowe products when you visit the salon, or by calling 323-654-2819 to order. Products range in price from $19.50 to $29. Be sure to ask about our 4 piece gift set for just $69.